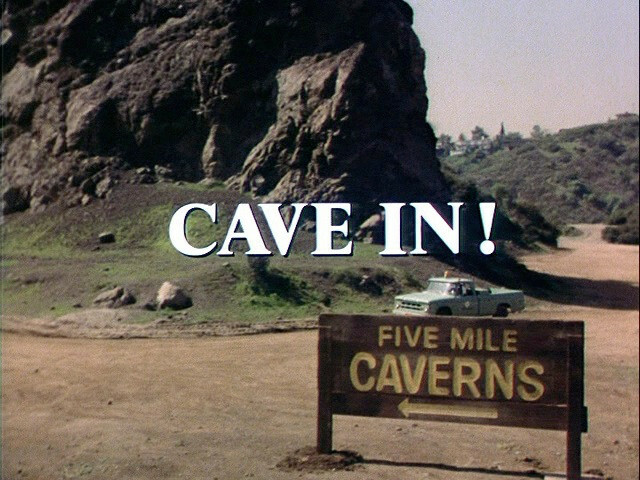 The premise of Cave-In! 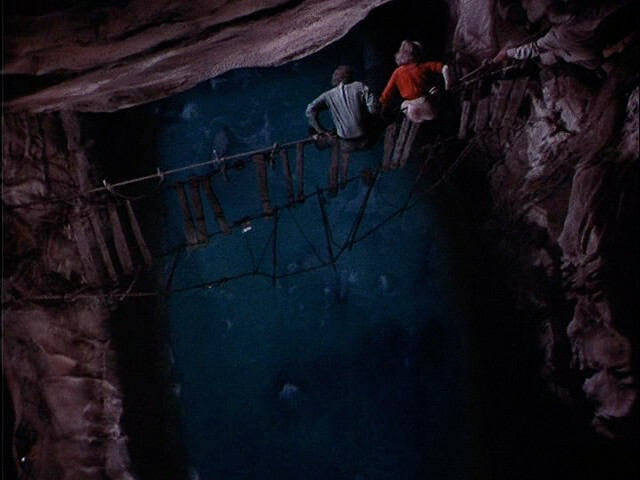 is that several people get trapped in Five Mile Caverns when their path to the elevators is cut off by a tunnel collapse. They have to go on a dangerous trek through non-public paths to get to the unused south entrance. It’s not clear how many of the five miles are involved in this trip. For that matter, it’s never mentioned where all of the other tourists were that they could still get out. 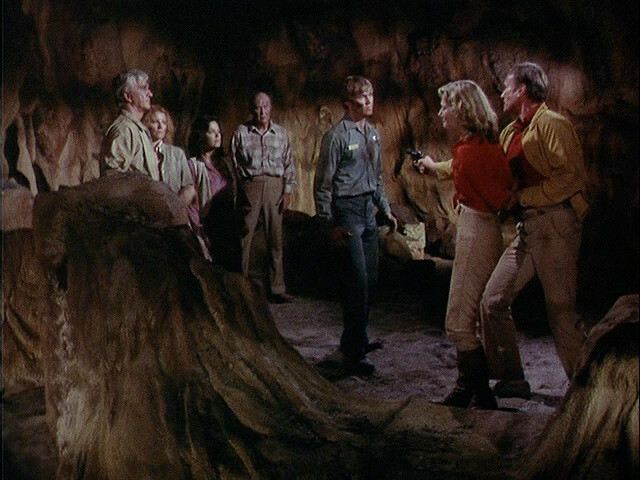 There are only a handful trapped in the “Opera Hall”: Chief Park Ranger Gene Pearson (Dennis Cole), State Senator Kate Lassiter (Susan Sullivan), former Detective Joe Johnson (Leslie Nielsen) and his wife Liz (Julie Sommars), Professor Harrison Soames (Ray Milland) and his daughter Ann (Sheila Larken), and violent fugitive Tom Arlen (James Olson). James Olson crossing the boiling stream. We never find out why Arlen was on the run, why he hid in the cavern, or how he got in without being noticed, but that’s honestly the least of the problems with this movie. It supposedly sat on the shelf for three years before finally airing in 1983, and the only thing I find unbelievable about that is anyone bothering to dust it off. Maybe they were just that desperate for content to try drawing viewers away from cable. It’s not the acting or even the effects that make it unbearable. Both hold up fairly well against TV movies of the age. Even the frequently clumsy insert shots and editing aren’t the biggest issue. What drags this film down is the script. Leslie Nielsen mopes through 80% of the film. Norman Katkov scripted TV episodes and the occasional TV movie from the 1950s through the 1980s. He also penned the Evel Knievel film Viva Knievel! with Antonio Santean, which makes him a legend in my book. This is not his finest hour. Seven people are trapped, with a grueling journey before them and a paranoid killer in their midst, and there’s little to no suspense until a few seconds of activity at the end. That’s because the majority of the story happened before the cave-in. There are no fewer than seven flashbacks, of varying lengths, that tell all of their stories (including one for Ann about an event at which she was not present). The peril is only a catalyst for bringing their tales to a conclusion. This could work if there weren’t so many plots, or if they didn’t drown out the immediate threats of Arlen and the treacherous cavern terrain. The best suspension in the movie. Ranger Pearson and Senator Lassiter had been planning to marry when they broke up three years ago because her campaign took too much of her time. Joe Johnson’s partner died at the scene of a holdup, and Johnson had been put on suspension for supposedly abandoning him. Professor Soames keeps his daughter Ann busy as his personal servant and has tried to drive away her suitor — apparently sparing the man’s life only because he has no attic. Arlen had been in prison for murder, and the prison shrink declared that he took every setback as proof of a conspiracy. All of this is good back-story, the kind of thing that a writer should know to inform character actions. But when you put all of it onscreen, it’s just story. That’s a lot of story for roughly 80 minutes. Apart from the screen time, all of this kills any suspense in their situation. 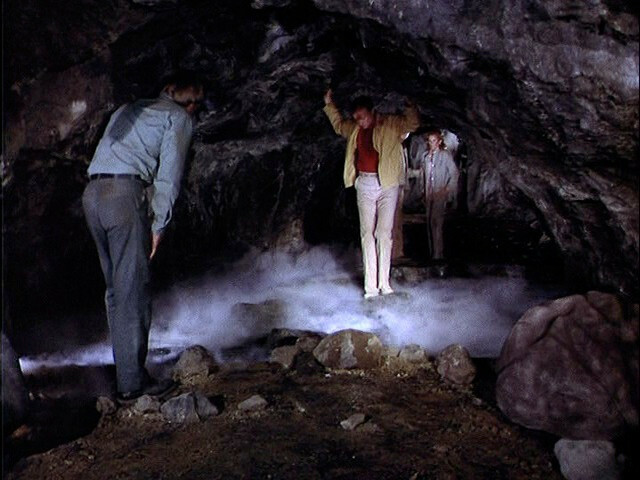 Once you realize that there are all of these plot threads to resolve, you know that they’re all perfectly safe from the perils of the cavern. Except for Arlen, of course. He’s the villain, so once they’re clear of the other danger, they’ll deal with him. Arlen finally makes his move, now that the audience is safely asleep. 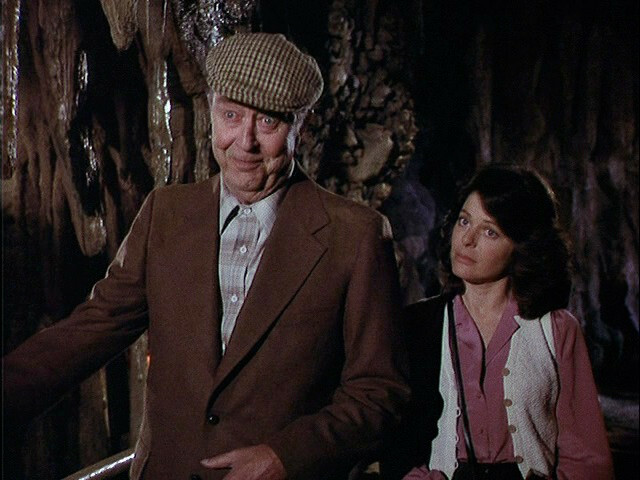 This is one of Ray Milland’s last roles, even with the 1979 date. By this point, he was usually relegated to the role of domineering patriarch, likely due to his role in Love Story. I rather enjoy watching crotchety old Ray Milland. His accent and diction were always studied and deliberate, which was charming and sophisticated in his youth. In old age, it lent an air of arrogance and authority that made his villains pompous authoritarians. Here, he portrays a self-centered and officious professor, and in the scenes where he gets to lecture and generally be insufferable Milland is a treat. It’s also fun to watch him completely avoid anything harder than standing in water. Hey, he was in his 70s. You don’t make the old man walk over rocks for a cheap TV movie. I just wish there’d been more for him to do! Cave-In! is too bad to be good and too dull to be enjoyable. I only saw it because of my undying affection for both Milland and Irwin Allen. 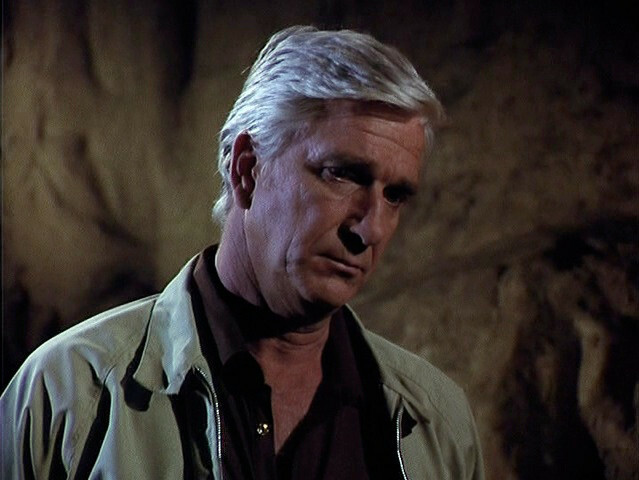 And serious-mode Leslie Nielsen. Okay, I kind of like James Olson, too. My point is that this isn’t for casual viewers. You need to really want to like this one to make it through. I really wanted to like it — so much so that I bought a copy after I’d already seen it and knew better! I still don’t like it, but every time I see it I really want to. That’ll just have to be enough.